Set sail in this classic child's sailor costume, reminiscent of the styles U.S. Navy sailors wore in WWI, WWII and even today. 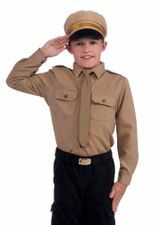 The child sailor costume includes a black pullover shirt with Navy logos and sailor collar with attached white neck tie, black pants, and white "Dixie cup" sailor hat with embroidered gold anchor. Check out more options in our Sailor Costumes and 1940's Costumes departments.